This is the concert that Richter fans have been waiting for! The program of April 4, 1952 introduces two composers–Borodin and Liadov–and five works to his recorded repertoire, and it has never before been published. This somewhat mysterious concert was Richter’s first piano performance after his first and only appearance in public as a conductor. It lasted only about an hour and consisted entirely of short Russian piano works. This recording is the only one ever published of Richter playing any music of Borodin (three selections from the Petite Suite) or Liadov (the Etude and Canzona and ever-popular Musical Snuff Box). It also contains Glazunov’s Nocturne in D Flat, Op. 37, and Scriabin’s Mazurka in E Minor, Op. 25, No. 3, also new to the Richter recorded repertoire. The remaining works on the program are by Rachmaninov, Scriabin, and Prokofiev. The authenticity of this recording is beyond question, as the original included spoken announcements clearly identifying the repertoire and the pianist. The first of these announcements is included as track 1 of the CD. Filling out this CD are two further Richter live performances of works new to his recorded repertoire: the Schubert-Liszt Erlkönig and Chopin’s Prelude in C Sharp Minor, Op. 45. The quality of the original recordings was gratifyingly fine and they have been subjected to no audio processing. All earlier volumes in the “Richter in the 1950s” series, begun in 1997, remain available. 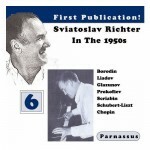 See them at our Sviatoslav Richter CDs page.